The 2017-18 team compiled a 3.62 GPA that placed Webster in the Top 25 of all NCAA D-III programs nominated for the award. For the 10th consecutive year, Webster University was recognized on Monday by the American Volleyball Coaches Association with a Team Academic Award for the 2017-18 season. The Team Academic Award, initiated in 1992 by the AVCA, recognizes teams who have matched their dedication to the sport of volleyball with excellence in the classroom. Teams must maintain at least a 3.30 cumulative team GPA on a 4.0 scale for the year or a 4.10 cumulative team GPA on a 5.0 scale. 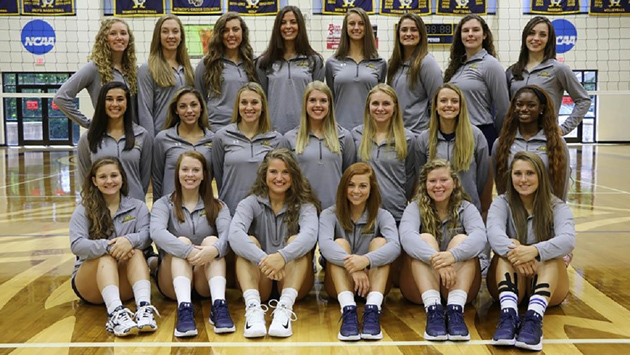 During the recently completed 2017-18 school year, Webster's volleyball team compiled a 3.62 team grade point average and that placed the Gorloks in the Top 25 of all NCAA Division III programs nominated for an AVCA Team Academic Award. "I'm very proud of the tradition of Gorlok volleyball. This is the 10th consecutive time the team has earned the AVCA award and the second year in a row that they have been in the top 25 of the country for NCAA Division III," said Webster head volleyball coach and Assistant Athletic Director Merry Graf. "The players work hard on the court, in the classroom and continue to be active in our community. This is a very impressive group of young women and I feel fortunate to work with them." Webster was one of four St. Louis Intercollegiate Athletic Conference schools to be recognized and one of a record 173 NCAA Division III women's teams to earn an AVCA Team Academic Award. In fact, the NCAA Division III women had the second most programs recognized as only Girls High School had more teams honored as they had 362 overall selections. Webster had a league-best 12 players earn SLIAC 2017 Fall All-Academic team honors for having cumulative GPAs over 3.50. The other SLIAC schools honored were Iowa Wesleyan, MacMurray and Principia. Overall, the AVCA had a record 973 teams earn a Team Academic Award for the 2017-18 season. The 973 honorees breaks last year's record of 835 teams that were honored. In addition, Webster was one of only 19 NCAA Division III Team Academic Award recipients that also reached its "Dig Pink" fundraising goals through the Side-Out Foundation. The 2017-18 season saw 'Dig Pink' participants and AVCA Team Academic Award winners raised a little over $1 million dollars for breast cancer research. The AVCA Team Academic Award is the single largest award offered by quantity of schools, players and coaches honored. Since the 2000-01 season, the number of recipients has increased every single year but two, while amassing a 619-team increase over the span of the last decade. Since the award's inception in 1993, the amount of award winners has increased from 62 to its current number of 973. Webster, who posted a 17-14 overall record and tied for second in the SLIAC last season with a 15-3 mark, opens its 35th season of intercollegiate volleyball on Aug. 31 at home in Grant Gymnasium against both Lincoln (Ill.) College and Benedictine University at 6 and 8 p.m. respectively.